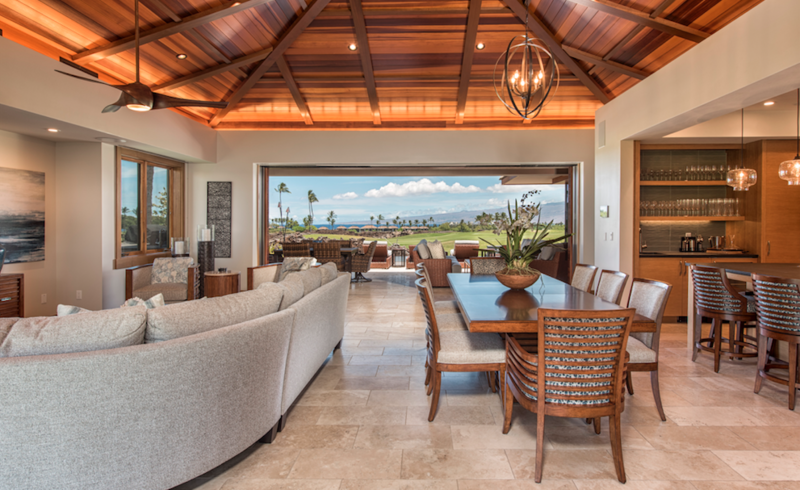 The Residences of Laule’a are “purpose-built” homes, says Jonathan Lawrence, VP of development and investment strategies for The Luxus Group, which developed the project’s 17 homes on a 5.3-acre parcel on the Big Island of Hawaii. “We wanted something that appeals to a vacationer” rather than a full-time resident, Lawrence says. To that end, the architects and designers focused their attention on key areas for vacationers: a luxurious master bedroom and a large great room that effortlessly flows onto an outdoor lanai. There, large sliding glass doors allow generous views of the area’s natural beauty and welcome the trade winds that drift between the mountains and the ocean. 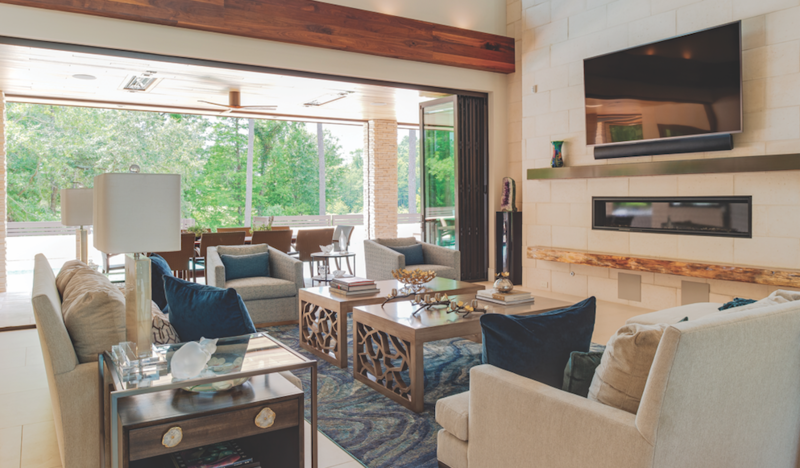 Buyers were offered traditional materials, such as African mahogany and travertine floors, as well as a customized modern scheme that includes limestone floors with gray tones and rift-cut white oak cabinets. 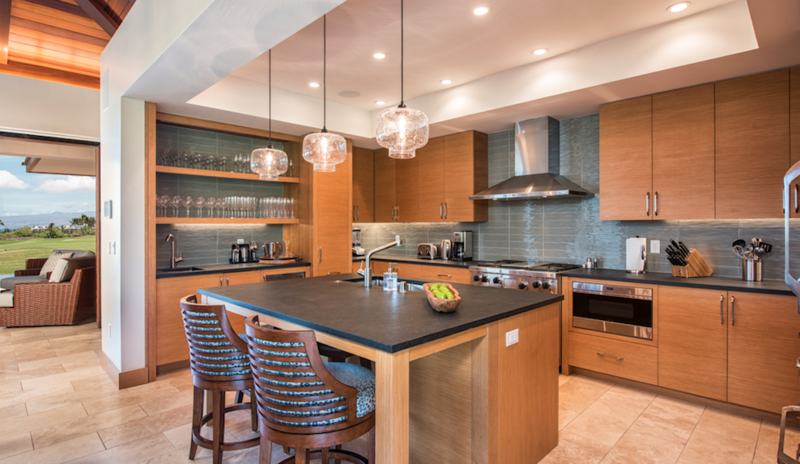 The Residences at Laule’a offer an open floor plan that includes a well-appointed yet efficient kitchen tucked to one side (above), and traditional island materials that blend with more contemporary finishes throughout (below). Builder: Tongue & Groove, Wilmington, N.C. The prow-like elements of the front elevation clearly mark the home’s entry and hint at the subtle nautical themes inside. When architect Phil Kean first saw the site for this house, he was inspired by the bridge over a small lake on the nearby golf course. “We picked up that axis and designed the house around the bridge,” he says, using that inspiration to create a visual bridge from the front door through the backyard. The mid-century modern design is “Prairie-esque” says Kean, and the house is oriented to welcome natural light. The layout leans toward an aging-in-place owner, with the primary living areas and a master suite on the ground level. A small elevator serves the upper floor, which is reserved for younger generations. The home caters to owners who entertain often and want to showcase their collection of three-dimensional art and sculpted glass works, which Kean accommodated with deep shelving and niches. Close to the Intracoastal Waterway and the Atlantic Ocean, water is a design theme, and the home’s entrance is defined by a koi pond and fountains. Inside, a warm, stained wood stairway and catwalk seem to float through the core of the house. The light-colored walls, stacked stone, large floor tiles, and modern fixtures offer complementary textures and a perfect balance of the natural and the luxurious. 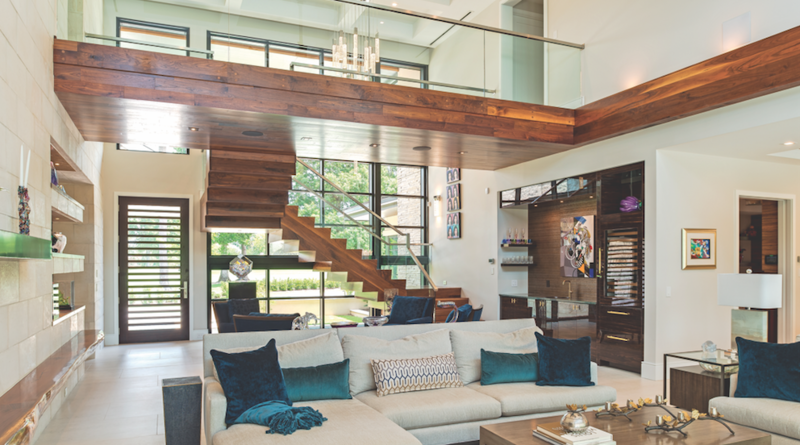 Nautical themes are highlighted in the interior by a floating staircase to a generous landing overlooking the main living area (below). White stone used on the exterior also continues inside, while natural wood adds warmth and comfort to the home’s modern vernacular. Folding patio doors and expansive glass create large, seamless openings and offer views to the outside (above); deep eaves reduce solar heat gain while admitting natural light. The building’s rear (above), with its balconies, reflects more extensive change than the facade. But overall, the original aesthetic remains, breathing new life into a building that many of the city’s residents are familiar with and value. 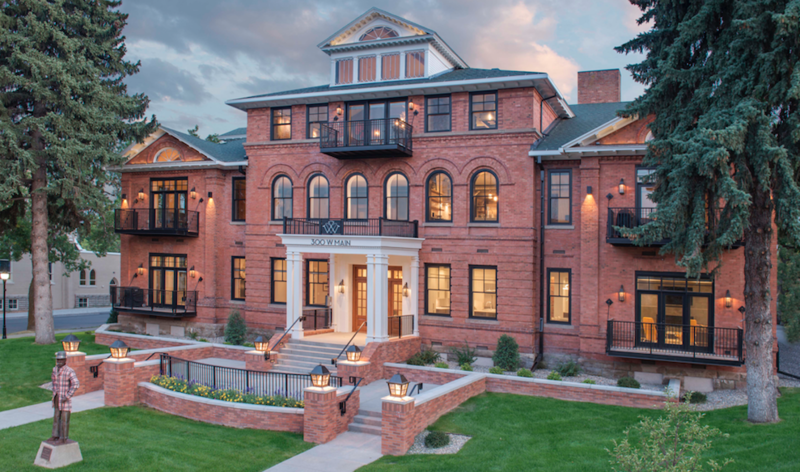 Bridger Builders, which developed this adaptive reuse project, is committed to preservation in a fast-growing Montana city that has lost several historical structures to new development. The old East Willson School in downtown Bozeman—originally Gallatin County’s first high school, built in 1902—was likely destined for the wrecking ball, too, until the plan to restore and convert it to 16 single-household, luxury condominiums went forward. The 50,000-square-foot brick structure needed extensive repairs, and the requirement to shore up the building to meet modern seismic standards increased the degree of difficulty. “We had to build a new steel and concrete structure into the old building,” says Bridger Builders co-owner Jim Syth. To pull that off, the perimeter of the slab had to be cut to install new footings with tons of steel and walls had to be shored up with rebar and shotcrete running from the basement to the roof. During demolition, workers uncovered architectural details that inspired interior designer (and Bridger Builders co-owner) Lois Syth to incorporate them into the design. 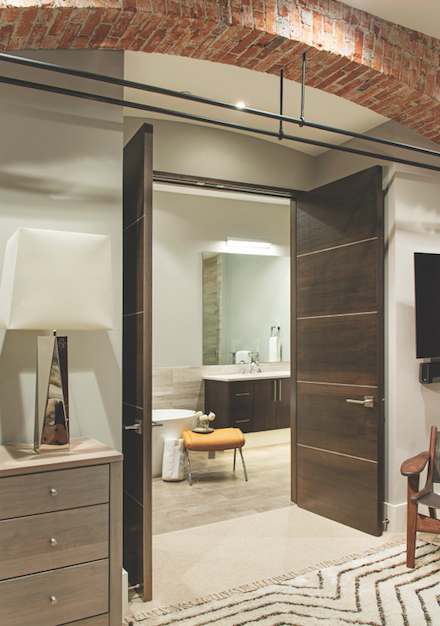 Previously plastered-over brick arches became focal points for living spaces. Three impressive Palladian windows, previously hidden from view in the interiors, were uncovered after a vaulted ceiling was constructed for third-story units. Bas-relief friezes, originally in the school’s auditorium, were discovered in another building undergoing renovation. After restoration, they were installed in the south entryway where they are now juxtaposed with hand-blown glass pendant lights. 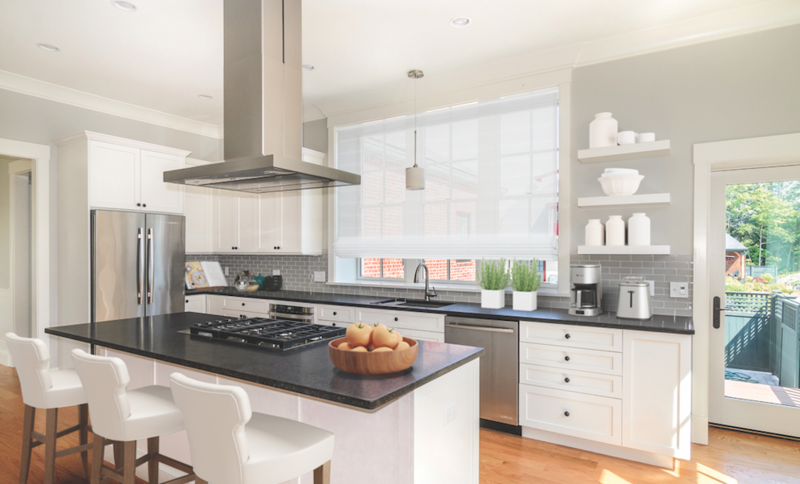 A few new elements, including skylights and a front portico, that weren’t historically accurate were added to boost appeal to the luxury market target clientele. “I felt the portico was needed to transform the building into a stately residential structure,” Lois Syth says. The front of the historical East Willson School remains largely preserved—save the addition of a stately portico to entice well-heeled buyers to the luxury for-sale condos. 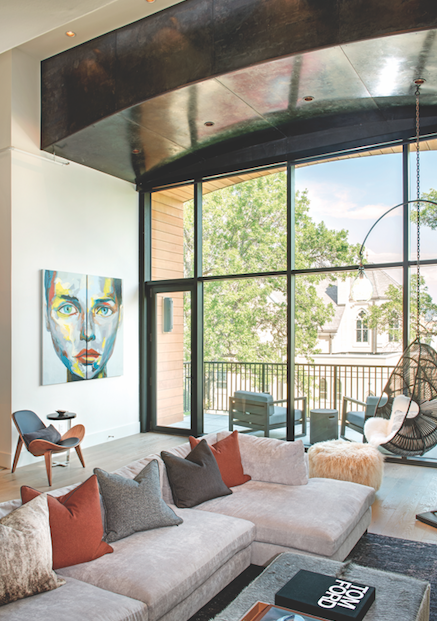 Extending the third-floor ceiling to create volume and additional living space (below) exposed large Palladian windows and opportunities for natural daylighting and balconies (above), which have further boosted the property’s value. Interior demolition and recovery of the old school building revealed several elements the design/build team revived as focal points, such as brick archways. 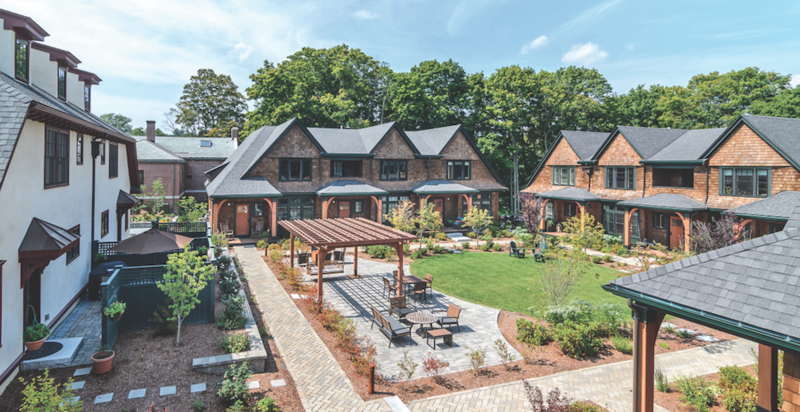 Designer/architect: Andrew Consigli, CIVICO Development, Wellesley, Mass. 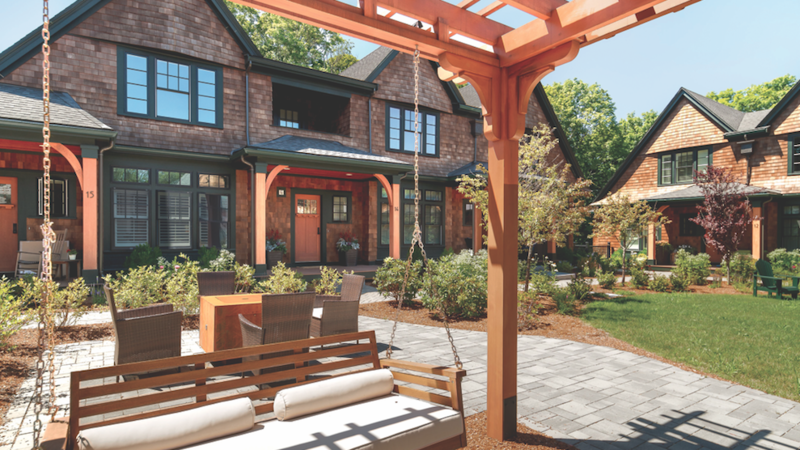 Builder: Rubicon Builders, Mansfield, Mass. Surrounding a central courtyard, the Abbey Road development offers a cluster of luxury condos that blend several complementary architectural styles, respecting the site’s history and context. The result is a contextually coherent, comfortable design well-suited to the project’s 55-plus target market. Set close to a bucolic New England small-town center, Abbey Road was inspired by historical buildings on the site. The red brick Edwardian-style Dowse Memorial Building, which anchors the development, was built in 1914 and originally housed the town’s library, later being used as an interfaith retreat center called Peace Abbey. The historical edifice was fully restored and the building converted into two townhomes. Another historical structure, The Parsonage—a former private home in the Jacobean style with a stucco exterior—was too run-down to save. But town leaders wanted to preserve this link to the past, so the developer agreed to build an exact replica, making it the only single-family structure on the site. 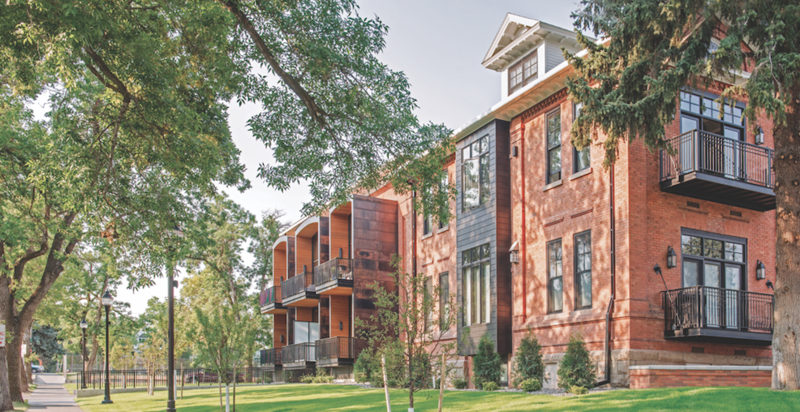 The exterior design of the new 18 luxury townhomes, which include front and back porches, takes cues from the Arts and Crafts movement. The three architectural styles on the property make contextual sense, as they all originated in the same era. 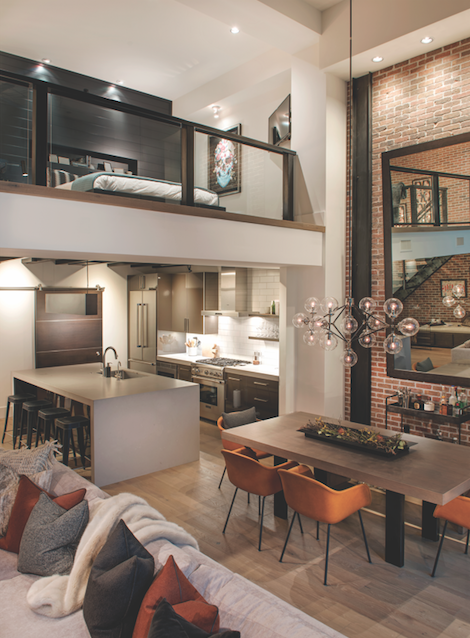 “We felt that the Arts and Crafts style complements the existing buildings,” says architect Andrew Consigli, owner of Civico Development, which developed the property with Fenix Partners. The sloped site enabled placement of garages under the townhomes, allowing expansive views and more daylight into the first level of each unit. The three-story homes are equipped with private elevators—a must, given the 55-plus target market. The developer partially defrayed the $30,000 cost of the elevators by choosing more economical appliances than the top-of-the-line models, a trade-off that buyers have accepted. With full-size, two-car garages tucked under the condos—made possible by the sloping site—natural light is abundant in the common spaces of the first floor. Elevators serve upper levels from the garage, easing concerns about aging in place among active-adult buyers and boosting resale values. While the exterior forms and detailing hark back to the Arts and Crafts movement, interiors (below) are designed and appointed in a decidedly contemporary style for convenience, efficiency, luxury, and comfort. 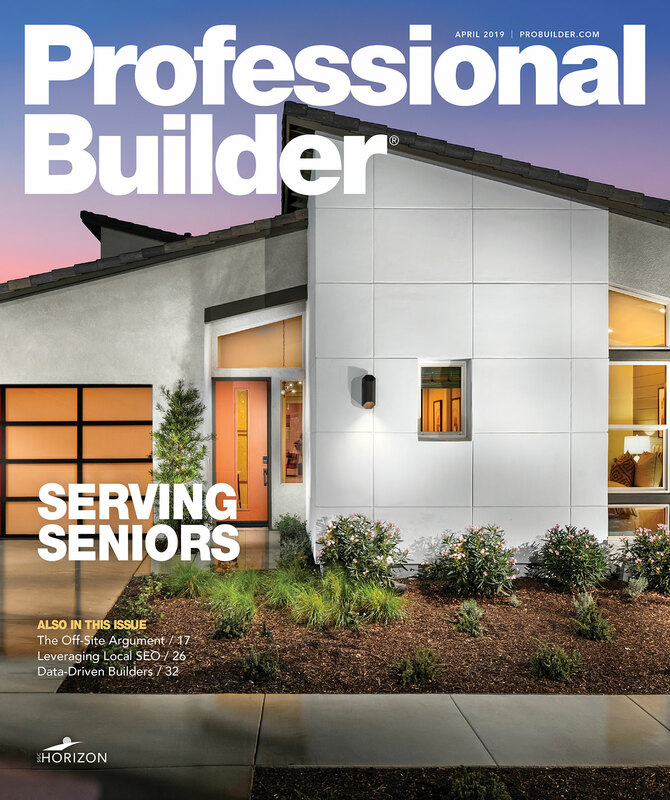 Senior editor, Professional Builder and Custom Builder, Arlington Heights, Ill.
Co-principal, Clarity Design-Build, Raleigh, N.C. Principal / senior architect, Dahlin Group Architecture | Planning, Pleasanton, Calif.
Executive vice president, Nuvis Landscape Architecture, Costa Mesa, Calif. Principal, BartonPartners Architects/Planners, Norristown, Pa.
For more winners, go to bestinamericanliving.com and take a look at past BALA designs.